It’s always nice to take a break from the usual routine- a small diversion can provide amusement, a new viewpoint, or just a chance to try something new. This month, I’ve decided to step away from the usual format and go with four posts which provide mainly information about three different elements of one larger issue: CITES. As some of you may know, mid-March witnessed the 16th meeting for countries involved in the Convention on International Trade in Endangered Species (this year is also the 40th anniversary of the original signing of the convention), and I was rather impressed with some of the decisions made at this year’s meeting (although a little disappointed with others). Rather than provide an end-of-month summary about the issue, I’m going to include suggestions for how to learn more and get involved in each post. I think it is important that we all understand what this convention regulates, how it works, and what we can do to support regulation of trade in flora and fauna. Did you know that a subspecies of northern bobwhite, the masked bobwhite, is listed in Appendix I? 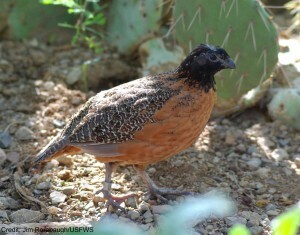 The species disappeared from the US and has since been reintroduced in Arizona, but there are still only a few hundred birds here. CITES was first signed in 1973 in response to the recognition that international trade in some endangered species was adversely affecting conservation efforts. The goal of this global agreement (177 signatories and counting) is to regulate trade in such a way that unsustainable use is avoided and no species are driven to extinction though exploitative trade by humans. There are quite a few discussions about the effectiveness of the convention as well as its jurisdiction, all of which I will address later, but first I want to give you background on the convention’s structure and how species get on the list. There are three Appendices which describe the different levels of regulation: Appendix I includes species for which only non-commercial trade is allowed under special circumstances, and such trade requires both a permit from the exporting country and a permit from the importing country. Currently there are about 530 animal and 300 plant species in Appendix I, and these species have typically seen a large reduction in population size, such as elephants and tigers. Appendix II includes the bulk of CITES-listed species (over 4,460 animal species and 28,000 plant species) and these species are felt to be at risk from meeting Appendix I criteria if trade is not regulated. These species can be commercially traded, however, permits are required from exporting countries. Appendix III includes species that specific countries list as requiring export permits from that country- the idea here is that countries which are concerned about the status of a nationally-protected species can ask other countries to make sure any exports from the listing country have the proper approval; if the species comes from a non-listing country, no permit is required. There are over 290 species in Appendix III. In order to get listed in Appendices I and II, a two-thirds majority vote by countries at a conference is needed. Countries can opt to take a ‘reservation’ which exempts them from the requirements for a specific listed species (this can undermine the impact of CITES). To list a species on Appendix III, a country must simply already have national protection for that species and then inform the CITES Secretariat of the decision. Species can also be moved between Appendices and removed from listing if that is deemed appropriate. There are provisions for penalizing countries which do not abide by regulations, and much of the pressure to follow CITES guidelines comes from the international community in the form of incentives, embargoes, etc. So the idea is oversight of global trade in vulnerable species to prevent species loss. One interesting comment I saw about the effectiveness of CITES is that there appear to be two different approaches to the program: one group of countries sees CITES as a means to regulate trade so that it is sustainable over the long-term, and the other group sees CITES as a final option in the face of extinction (Sky 2010). If species aren’t listed until their populations are already in massive decline, their chances of recovery and allowing for sustainable harvest are probably worse than if the species is listed when trade is picking up but the population remains at more than 20% of the original baseline. I highly recommend that you take a look at the CITES website which has information on the recent meeting as well as specific programs. You can look at the status of listed species, as well as which species have been listed by your country. The global and national trade dashboards can give you a picture of trade trends over time (the global bird trade was particularly scary). I think that people tend to remember ivory and rhino horn when they hear about trade in endangered species, and they don’t always know about the smaller, less charismatic species which are at risk- looking through the information on CITES listings is a good place to get a more global view. Over the next few weeks, I’ll be looking into each Appendix in turn and some of the listed species, but you may want to do a little investigation on your own. Sky, MB. 2010. Getting on the list: politics and procedural maneuvering in CITES Appendix I and II for commercially exploited marine and timber species. Sustainable Development Law & Policy Spring: 35-55.